I am Jfoster90, friends with @sorinjace, @Aryanf, @Dechujoh64, and @TemurGideon. 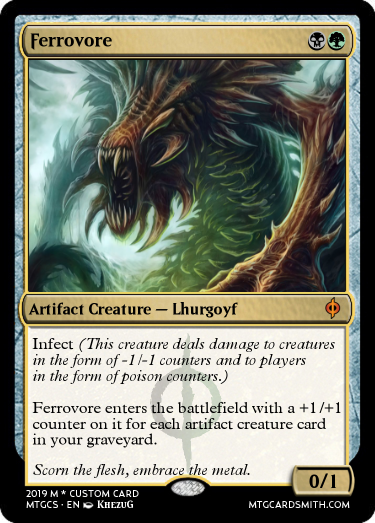 This contest i would like to see the keyword "infect" be used. 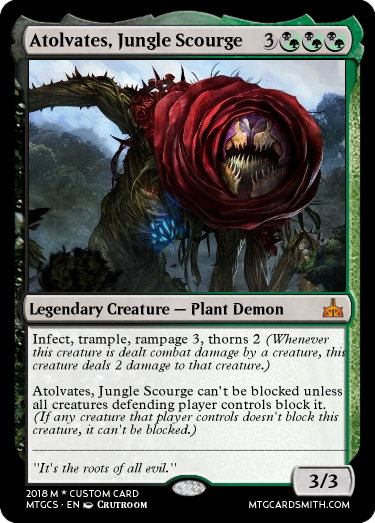 This contest was influenced by a discussion between myself and TemurGideon, and his dislike of infect and how he feels its not a strategy, just like he loathes when Sorinjace mills him, or uses infect. I am still fairly new at this game, and want to learn more. 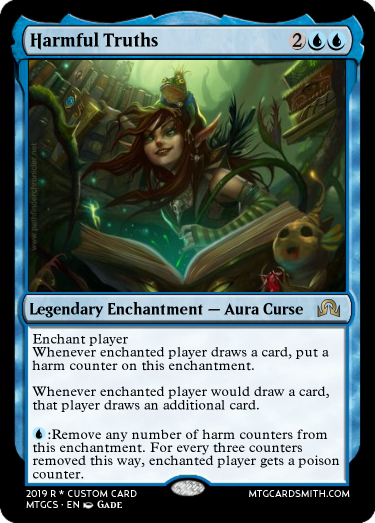 I look to SorinJace to teach me the proper way to play, while TemurGideon teaches me the house rule way to play. 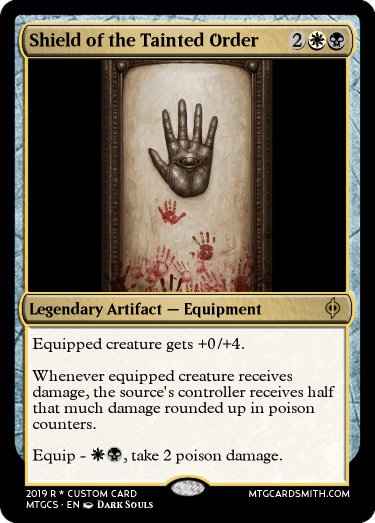 I also learn from playing the android game, Forge and playing MTG Arena online, and of course, from creating cards on MTG Cardsmith. 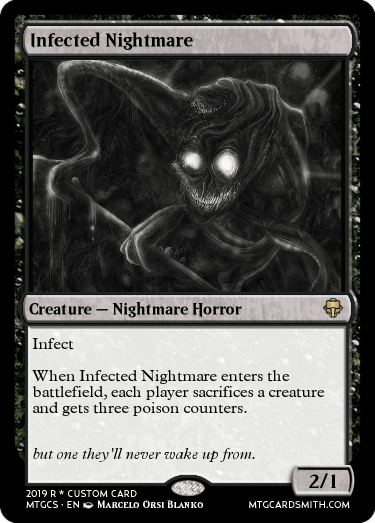 You ask what is "Infect?" 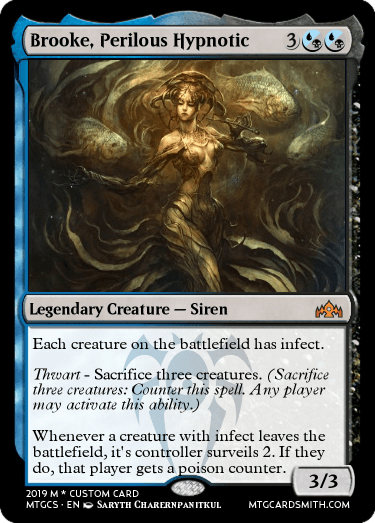 Infect is a keyword ability that was introduced in Scars of Mirrodin. 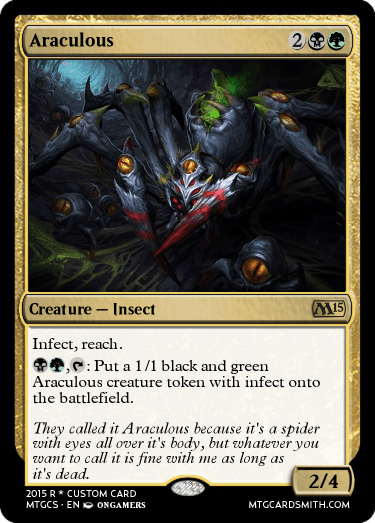 It is centered in black and green with some artifacts having the keyword. 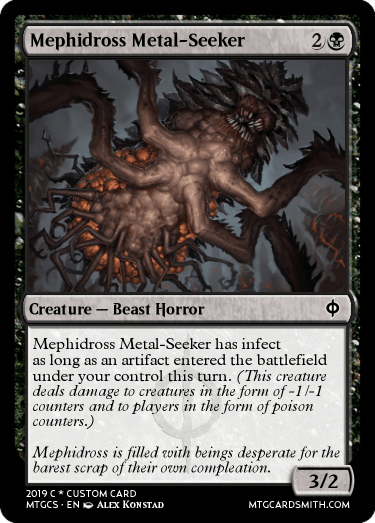 It combines poisonous and wither abilities. 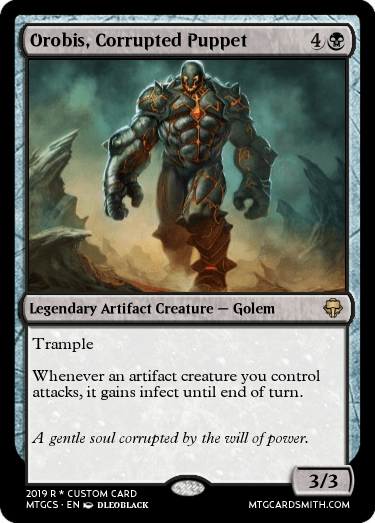 In Mirrodin Besieged the mechanic was expanded to white. 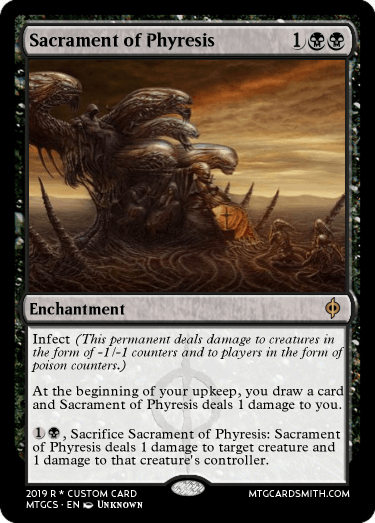 -Infect's effect applies to any damage, not just combat damage. 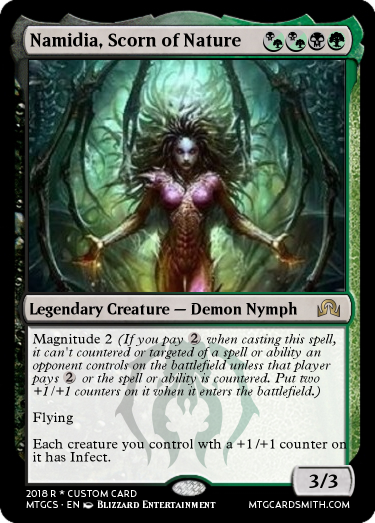 -The -1/-1 counters remain on the creature indefinitely. 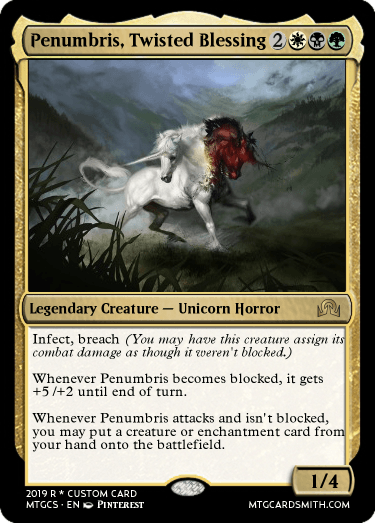 They're not removed if the creature regenerates or the turn ends. 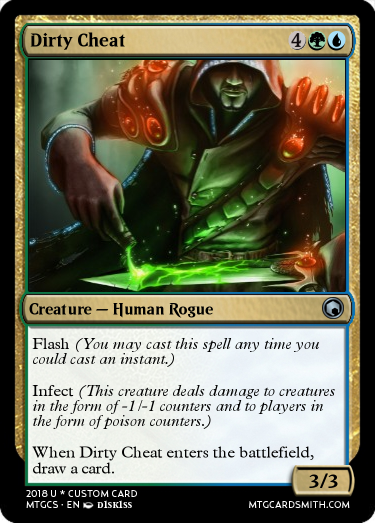 -Damage from a source with infect is damage in all respects. 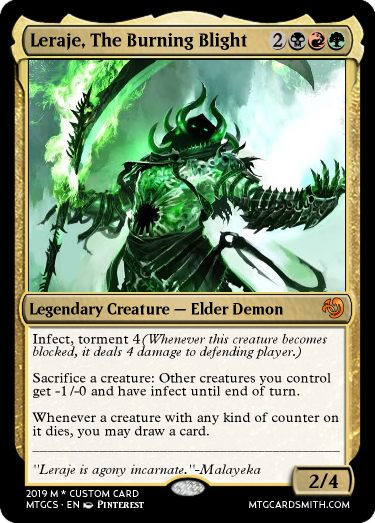 If the source with infect also has lifelink, damage dealt by that source also causes its controller to gain that much life. 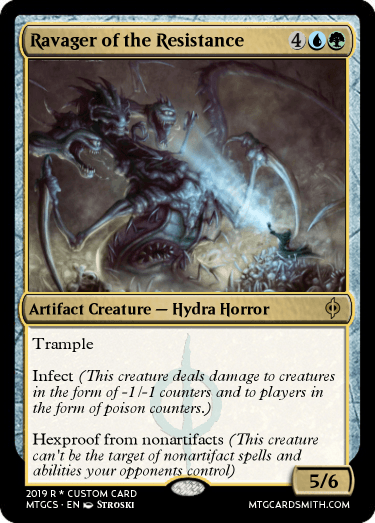 Damage from a source with infect can be prevented or redirected. 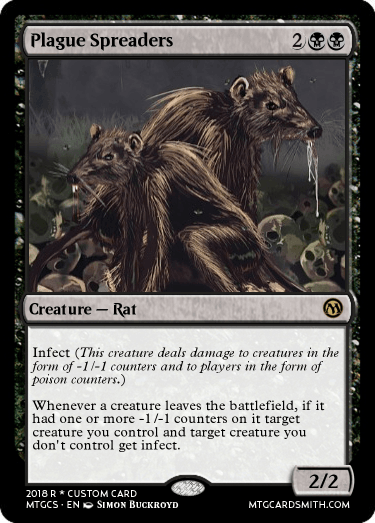 ---Abilities that trigger on damage being dealt will trigger if a source with infect deals damage, if appropriate. 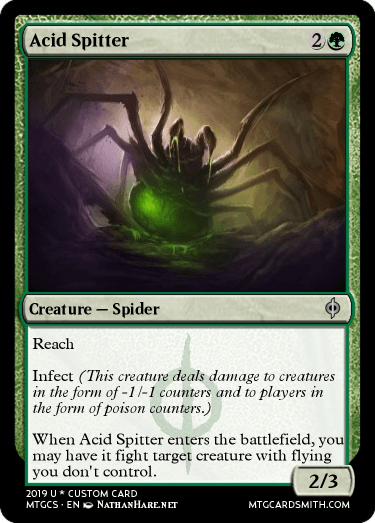 -If damage from a source with infect that would be dealt to a player is prevented, that player doesn't get poison counters. 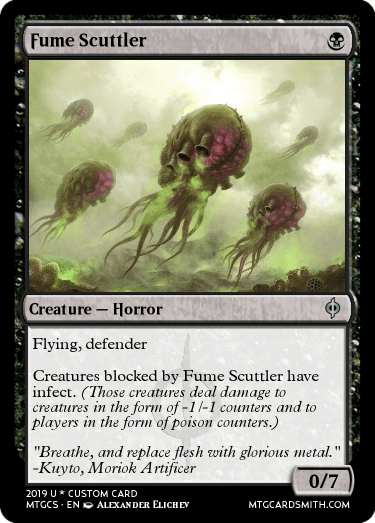 If damage from a source with infect that would be dealt to a creature is prevented, that creature doesn't get -1/-1 counters. 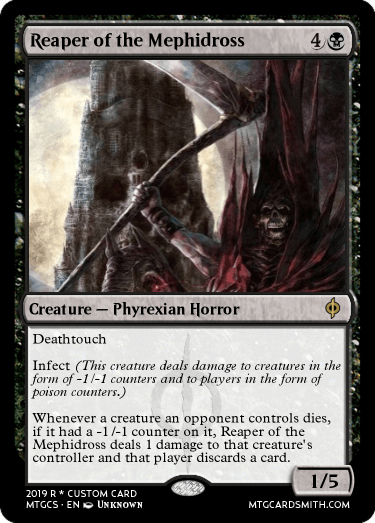 -Damage from a source with infect effects planeswalkers normally. 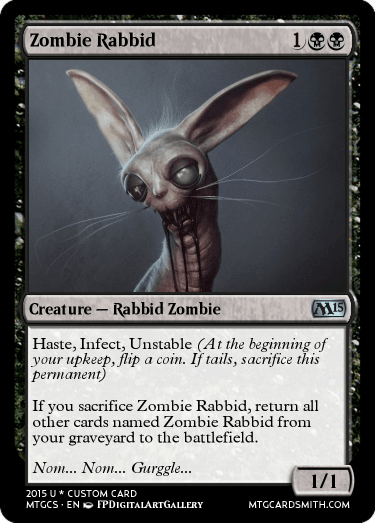 Cards utilizing Infect. They can be any type of card. Thanks @sorinjace for helping me edit the layout of this contest. P.S. You can edit your cards and repost them in the comments. I will try my best to go around and make small critiques, to help. 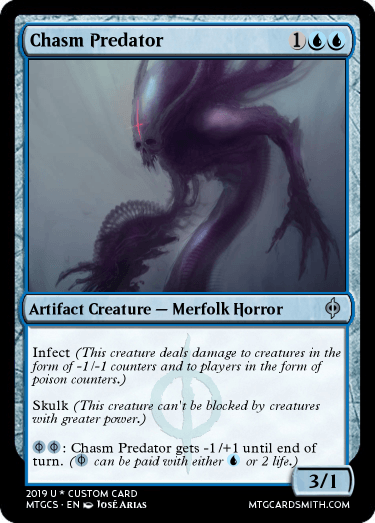 I don't do a ton of infect as I am not a huge fan of it (In commander it's basically quadruple strike, why my playgroup goes to 15 instead of 10. 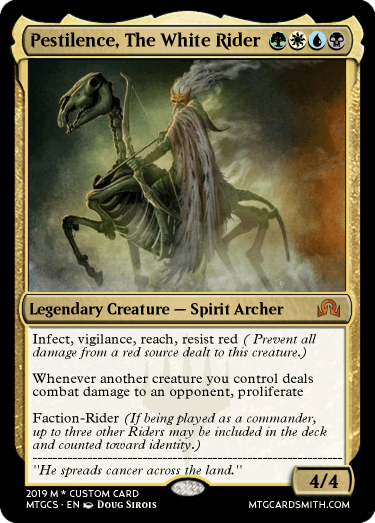 ), but this the cards I currently have, see if I can think of anything new. Ehhhh.... it isn't though. 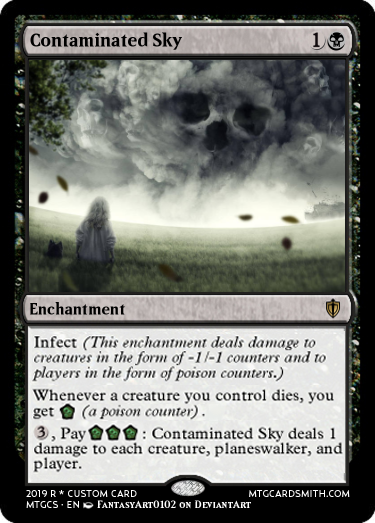 They took Wither, something I like, and they made it dumb and OP. Thank you @Corwinnn, @Lastjustice and @pjbear for the early entries. I am hoping for this contest to be off the chain. Here are two entries from me. 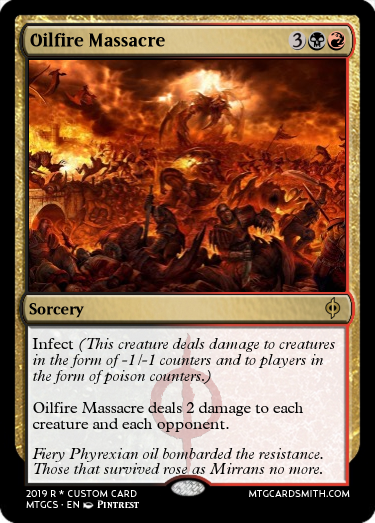 Infect is one of my favourite "strategeries". 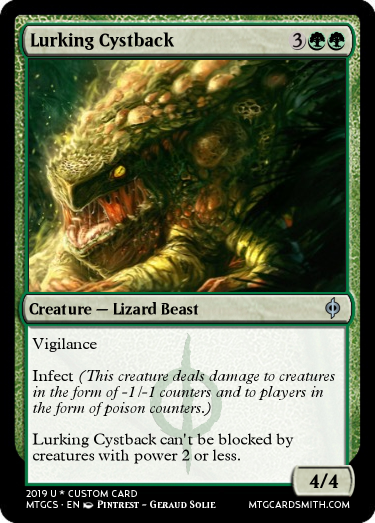 Yeah, I know infect is not in standard, give me a break. It's a made up card and I have a big imagination. We are almost at the halfway over point for these contest. I would like to extend a thanks to, @Corwinnn, @Lastjustice, @pjbear, @Vulcanthrax, @sorinjace, @IronCrusher, @bnew07, @faithsguide, and @TenebrisNemo for getting your entries in early. 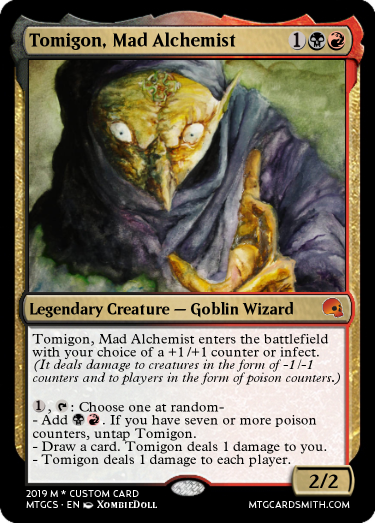 Thank you everyone for taking the time to, create or dig through your old cards to find the diaminds in the rough. @Jfoster90, check the name of your challenge. @Skrypt. It is part of the joke. @Skrypt must have been really young during the George W bush administration to not get the reference. I will try not to break a hip on the way out of this topic. 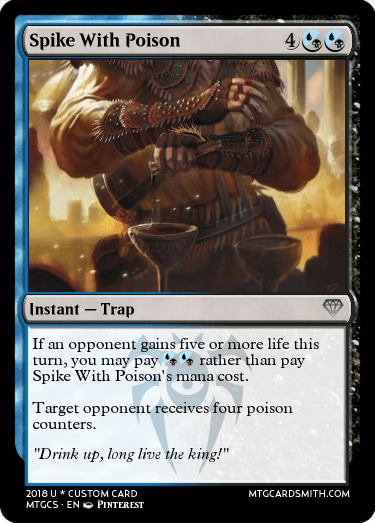 I wanted to use my custom poison counter symbol, so I Photoshopped the card. 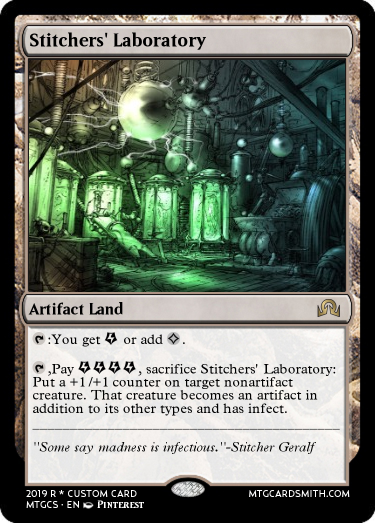 I'll make a new one soon, i missed these cards when searching for older cards with infect! Thanks everyone who has posted, since the start of this contest. I appreciate all of you cardsmiths. 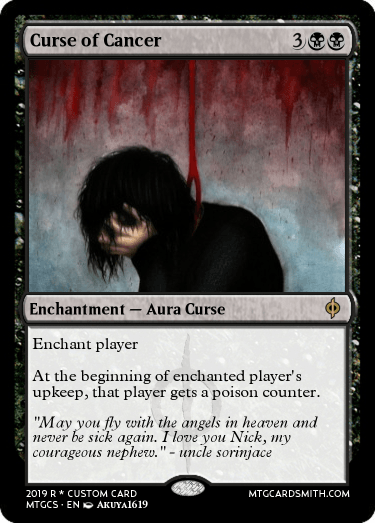 I know it doesn't say infect, but it still does the effects of poison counters. 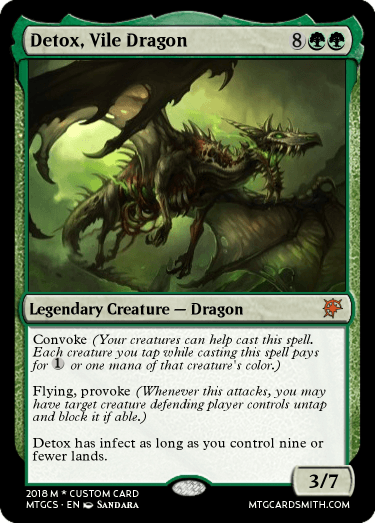 @Sorinjace I imagine the key point is putting poison counters to win not using the keyword infect per say, as I have a few worded that way myself. 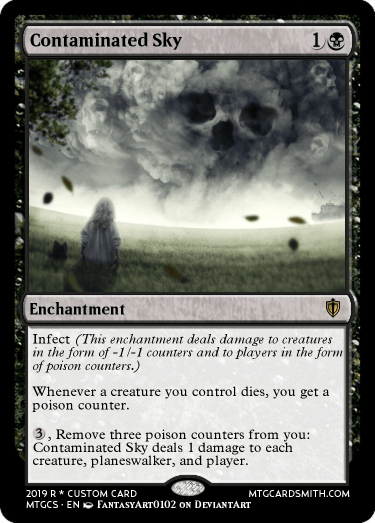 I think most people use poison counters interchangeably with infect. If @Jfoster90 was being a stickler about that, I am sure he'd flagged for by now. I asked him to put this card in the contest just for. 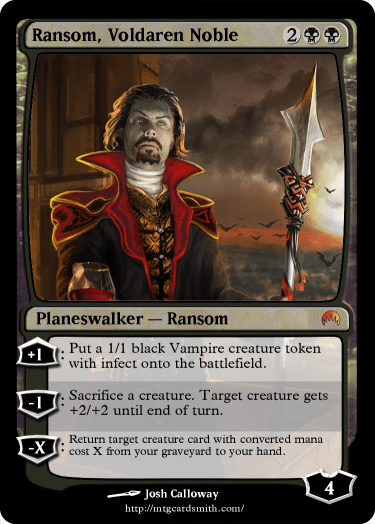 Not actuslly going to use it against his card count, just giving his card a little more exposure, and letting him express his RIH for his nephew.